Crostini di fegatini—bread slices topped with a savory chicken liver paste—are the iconic Tuscan antipasto. In this version from Giuliano Bugialli’s classic work, The Fine Art of Italian Cooking, the liver paste is flavored unusually with juniper berries, a touch that Bugialli says evokes the autumn hunting season. Whether or not you’re a hunter, the taste is absolutely exquisite. Sauté the garlic and sage leaves gently in the oil and butter until the garlic is just beginning to brown. Add the chicken livers and sauté for 10 minutes or so. Then add a pinch of salt and pepper, along with the juniper berries, slightly crushed with the back of a knife or in a mortar and pestle. Turn and add a ladleful of broth. Let things simmer for 15-20 minutes. Off heat, drain the chicken livers in a colander, saving the liquid and removing the garlic and sage leaves. In a food processor, chop the livers until you have a roughish paste—don’t overdo it—and then scrape the liver paste back into the skillet, along with the reserved liquid. Thin out the paste with another ladleful of the broth, and simmer gently until almost all the liquid has evaporated. Just before it’s done, mix the chopped anchovies and capers and simmer for a minute or two more, until the anchovy has melted completely into the paste. Taste for seasoning and remove from the heat. Let the liver paste cool for a few minutes. Serve the liver paste on slices of bread, toasted or not as you prefer. You can serve Chicken Liver Crostini warm or at room temperature. The liver paste can be made ahead and, if you like, gently reheated with a bit of broth or butter; in fact, many say it’s tastier that way. The traditional bread for crostini is, of course, Tuscan bread. If your local bakery or market doesn’t carry Tuscan bread, then a good homemade bread will do very well—if you want it to emulate the Tuscan variety, leave out the salt. You can also opt for any bread with a good crust and firm crumb. Personally, although not traditional, I like to use a good quality baguette, which makes for a smaller crostini that are easy to handle and perfect for a cocktail party. The bread can be toasted or not, as you prefer, although for much of the bread you can buy these days, toasting is a good idea, as it firms up the crumb. I also like the extra layer of flavor it adds. For a really rich version, Bugialli says that frying the bread slices in olive oil “works very well”. Most recipes for Chicken Liver Crostini follow essentially the same pattern, although the addition of juniper berries in this version is rather unusual. Onions, either by themselves or mixed with a bit of carrot and celery, can take the place of garlic for the initial soffritto. Some recipes call for a drizzle of wine or vin santo, and the livers can be complemented with a few chicken hearts and/or a bit of crumble sausage. Capers and anchovies sotto sale—packed in salt—work better than those in packed brine or oil, if you can find them; the anchovies are optional but do give a nice, not at all fishy, flavor. 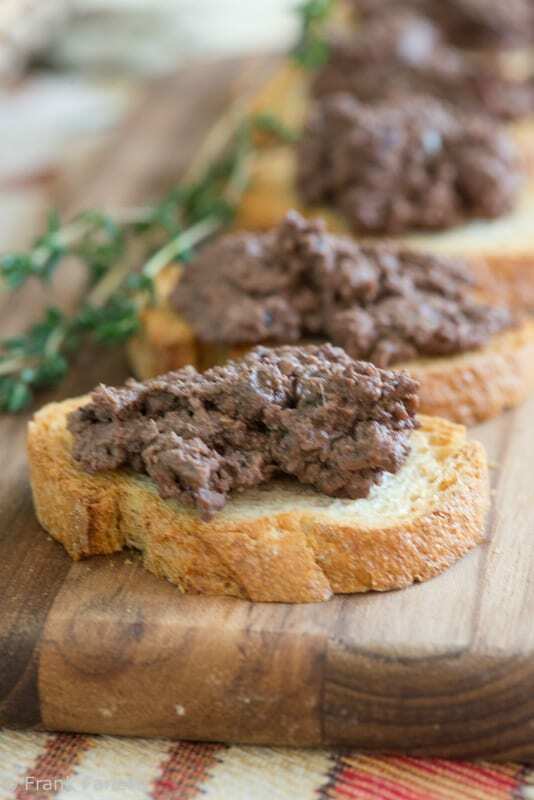 Many modern recipes for Chicken Liver Crostini call for much shorter cooking times than Bugialli’s recipe, just long enough for the livers to lose their rawness, adding just enough broth to moisten them a bit. Crostini are often confused with bruschetta, another bread-based antipasto. The difference is that bruschetta is, by definition, made with toasted bread slices, rubbed with garlic and drizzled with oil. If you like, your bruschetta can be topped with tomato, but that’s optional. Crostini may or may not be toasted but always carry a topping, which—besides the classic Tuscan chicken liver paste—can be just about anything you could imagine. To make things a bit more complicated, the Tuscans have another name for bruschetta: fettunta, or ‘anointed slice’. And just so you’re totally confused, there are also crostoni, made with large slices of bread; even though originally crostini were made with slices of Tuscan bread, which are rather large to begin with, these days, crostini made with baguette has become so popular that another word has become necessary to distinguish between the two versions. Off heat, drain the chicken livers in a colander, saving the liquid and removing the garlic and sage leaves. In a food processor, chop the livers until you have a roughish paste—don't overdo it—and then scrape the liver paste back into the skillet, along with the reserved liquid. Thin out the paste with another ladleful of the broth, and simmer gently until almost all the liquid has evaporated. Just before it's done, mix the chopped anchovies and capers and simmer for a minute or two more, until the anchovy has melted completely into the paste. Taste for seasoning and remove from the heat. Let the liver paste cool for a few minutes. Serve the liver paste on slices of bread, toasted or not as you prefer. You can serve Chicken Liver Crostini warm or at room temperature. The liver paste can be made ahead and, if you like, gently reheated with a bit of broth or butter; in fact, many say it's tastier that way. The traditional bread for crostini is, of course, Tuscan bread. If your local bakery or market doesn't carry Tuscan bread, then a good homemade bread will do very well—if you want it to emulate the Tuscan variety, leave out the salt. You can also opt for any bread with a good crust and firm crumb. Personally, although not traditional, I like to use a good quality baguette, which makes for a smaller crostini that are easy to handle and perfect for a cocktail party. The bread can be toasted or not, as you prefer, although for much of the bread you can buy these days, toasting is a good idea, as it firms up the crumb. I also like the extra layer of flavor it adds. For a really rich version, Bugialli says that frying the bread slices in olive oil "works very well". In preparing for a tasting for chianti producer, I suggested to the enteca hosting the event that they serve Crostini di Fagatini to compliment the wines. Low and behold, I was asked to guide the chef. After some quick internet research, I came across you recipe which I actually learned from Giuliano a number of years ago. Thank you for this trip down memory lane and a pity you do not live close by to sample the wines in July. Delicious! Thanks for the recipe. First time having chicken liver and it was fantastic! It’s fantastic that you made and enjoyed the dish, Matthew! Thanks so much for your comment. Thank you for your note on crostini vs bruschetta, which are too often confused. In Umbria, where I grew up, these are actually crostini by definition. An iconic dish from a real icon. I adore Sig. Bugialli. He did somehow miss out on the timing and promotion to ever hit it real big here, and that is a darn shame. His books are treasure troves of knowledge, and the most worn on my shelf. Have you ever taken a class with him? If you have not, and find yourself with the opportunity to do so, then go. You will have a wonderful time, and I can guarantee some spirited conversation. And I am quite certain that he will deeply appreciate your dedication to Italian cooking. A while ago a friend and I, Terry Mirri,of Artisanal Pasta Tools were talking about just how much we all owe to him. The debt is incalculable. I’ve never had the pleasure of meeting Sig. Bugialli—perhaps one day… Meanwhile, his books are among my most treasured. It really is a shame he hasn’t gotten quite the recognition he deserves. Frank…although this sounds great…and my husband would kill for these…it not only has the dreaded chicken livers but anchovies…I know what you are thinking…what is the matter with this woman and I am sorry…Joe can have my share! The juniper berries, I think are a great addition! I wish I could wrap my little taste buds around the aforementioned “don’t likes” because it makes things a bit tricky when we are in Italy…unless, of course, you can reassure me that the crostini don’t taste like either of liver or anchovies! Love you and love your blog! Bugialli’s recipes are the real deal, no question. I haven’t had chicken liver crostini in a long time. My mother used to make them when we had company. She cut the livers into small pieces and sautéed them in agrodolce. This would be a really nice Thanksgiving appetizer. Thanks for the inspiration. It’s a shame that Bugialli never achieved the same popularity as, say, Marcella did. As you say, he’s the real deal. I love that his recipes are grounded in deep historical and culinary research. Love the sound of your mom’s version—can I find it on your blog? I adore this appetizer. Not sure anyone else in my family does – but this makes me ache for Italy. And – drum roll – I actually have juniper berries! It’s fate! l’aggiunta della bacche di ginepro mi incuriosisce molto. Ne ho mangiati tanti durante l’ultima vacanza tra Toscana e Umbria ma devo riconoscere che questa tua versione è la più originale ! Buon fine settimana Frank !